Kingspan Insulation presents a technical bulletin that provides guidance on the use of exposed insulation in warehouses and commercial or industrial sheds. 1. Can the exposed insulation in warehouses and commercial or industrial sheds be considered a wall or ceiling lining? 2. If so, what fire performance requirements does it need to meet to demonstrate compliance with the deemed-to-satisfy provisions of the National Construction Code’s (NCC) Building Code of Australia (BCA)? To address these questions, Kingspan Insulation engaged independent chartered professional fire safety engineer, Ignis Solutions to produce a Fire Safety Evaluation. The report assesses the fire safety performance requirements of the NCC BCA Volume One to help clarify the definitions, intent and deemed-to-satisfy compliance requirements for exposed insulation in walls and ceilings. It also details the relevant Australian Standards as well as the appropriate test methods that should be applied. What is a wall or ceiling lining? A lining is any material installed in a wall or ceiling that is exposed to the internal compartment of a building. Is insulation considered a wall or ceiling lining if it’s left exposed on the interior? Yes, it is considered to be a lining because it is left exposed. If plasterboard, for example, is used to line the internal side of the wall or ceiling, then the plasterboard will be considered the lining material. However, when no plasterboard is installed, the insulation left exposed will be considered the lining material. In a fire event, the lining material’s resistance to spread of flame and fire development is what will help keep the fire contained within the internal compartment of a building, and allow time to evacuate the area safely. What are the NCC fire performance requirements for wall and ceiling linings? What is a Group Number? A Group Number is a fire hazard property classification, which is calculated based on test results. Group Numbers range from Group 1 to Group 4, with a Group 1 classification representing the best performance. How is a Group Number achieved? What are the differences in the test methods? AS/NZS 3837 and ISO 5660.1 are small scale tests using only a small specimen of material. They are considered predictive tests as the results can be empirically correlated to how the material might behave in a large scale fire, depending on the material. AS ISO 9705, on the other hand, is a full scale fire test conducted in a fire test room measuring 3.6m long x 2.4m wide x 2.4m high, which is installed with the material. It tests how a material behaves in an actual full scale fire event. Which test method is the right one? d. It has a reflective surface. What common insulation products need AS ISO 9705 testing to achieve a Group Number? Common insulation products that require testing to AS ISO 9705 to achieve a Group Number include foil-faced glasswool insulation blanket; foil sarking; reflective insulation; expanded or extruded polystyrene; insulated sandwich panels; and foil-faced rigid phenolic or PIR boards. Why is small scale testing to AS/NZS 3837 or ISO 5660.1 not acceptable for these products? Regulators have recognised that there is very poor correlation between the small scale tests and how these products would perform in a real full scale fire. For example, the foil facing on composite insulation products can protect the insulation in the early stages of the small scale AS/NZS 3837 test. In the large scale AS ISO 9705 test, however, due to the involvement of more material and the confines of the test room, there can be much greater heat development which can lead to an earlier flashover than predicted in the small scale AS/NZS 3837 test. Temperatures could get higher than 750°C, at which point even glasswool and materials considered ‘non-combustible’ may burn. Therefore, the large scale AS ISO 9705 test gives a far more accurate representation of a material’s fire resistance properties. Since the performance of these products in the small scale AS/NZS 3837 test is not indicative of the material’s true performance in a real full scale fire, they cannot claim a Group Number based on it. Instead, they must be tested to AS ISO 9705. What if a supplier of one of these products claims a Group Number based on AS/NZS 3837 or ISO 5660.1 testing? What Group Number do I need for warehouses and commercial or industrial sheds? Does Kingspan have a compliant product for these building types? The Australian-made Kingspan AIR-CELL Insuliner is the latest in thermo reflective insulation technology with the most advanced fire performance characteristics, achieving a Group 2 classification when tested to AS ISO 9705. Warehouses and commercial or industrial sheds are steel buildings. Do they need an R0.2 thermal break? No. 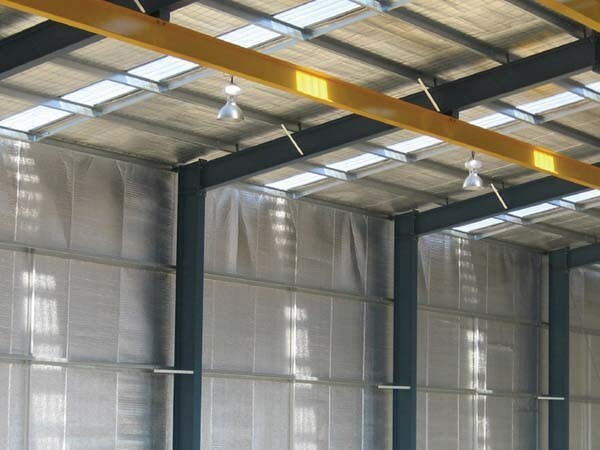 Since the vast majority of warehouses and commercial or industrial sheds are not air-conditioned or heated, the NCC does not require these structures to have a thermal break.